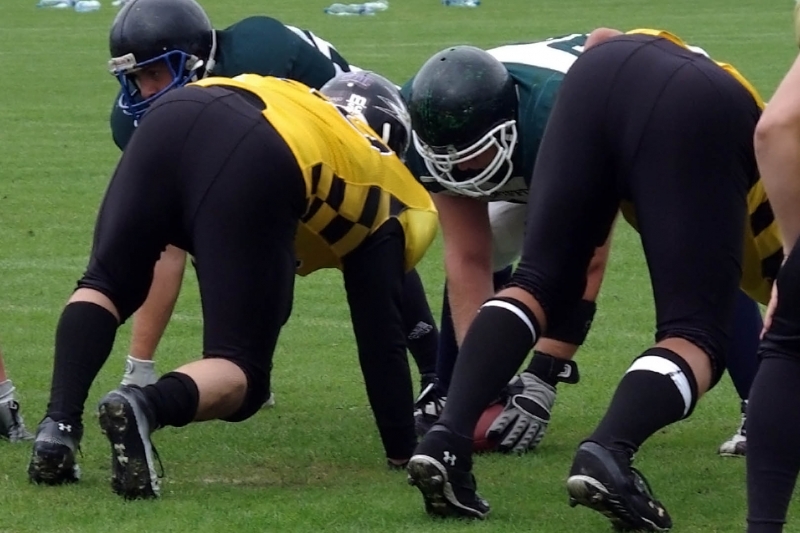 The lineup for the PLFA 8 final tournament on October 7 in Warsaw has been set after an exciting second weekend of eight-man football. 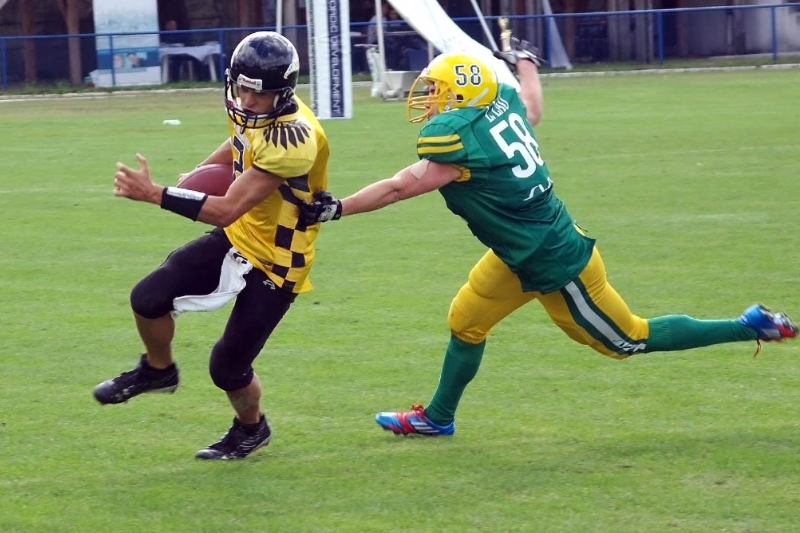 The AZS Silesia Re'B'els took the title in the South Group, narrowly defeating the Broncos to knock them out of the race to get to the final tournament. The Spartans B team upset the Eagles B team in the Central Group final, although both teams advanced to the final tournament as the Eagles B held the tiebreaker advantage over the Broncos in the wild card race. Finally, in the North Group, the Seahawks won the division outright with a 3-1 record. Here is a recap of the action in each of the three tournaments played over the weekend. Overview: The most defensive group from the first weekend of PLFA 8 became the most offensive during the second, with the Re'B'els scoring 79 points in two games while giving up 76. Although the Giants B finished without a win in either tournament, the Broncos were the division's hard-luck story—they won all three games in round robin play before losing the final by two points, missing out on a trip to the final tournament in Warsaw in the process. The final between the Re'B'els and the Broncos proved to be the highest scoring game in the first two seasons of PLFA 8 play. Game 1: Łukasz Rębowski and Adrian Mazurek each scored a pair of touchdowns for the Re'B'els, who jumped out to a 23-8 lead early in the second quarter. The teams then traded touchdowns before the first of two Jindra Strobl touchdown runs cuts the halftime deficit for Skoczów to 31-22. Silesia scored the only points of the third quarter to make it 37-22 before Strobl scored again in the fourth. The Pretorians missed the conversion attempt, however, leaving them facing a 9-point deficit that proved too large to overcome. The Re'B'els held on to win by a single point, 37-36. Game 2: With the pairings for the third-place and championship games already decided, the Broncos beat the Giants B 20-14 as a warm-up for their clash in the final with the Re'B'els. The Broncos extended a modest 6-0 halftime lead to 20-6 at the end of three quarters, before a Maciej Hałoń touchdown reception made the endgame interesting. 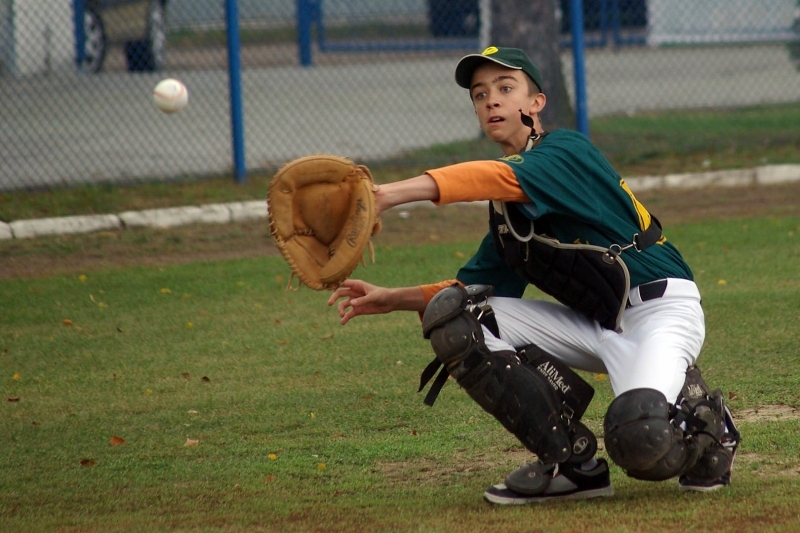 Sucha Beskidska held on to keep the Giants winless in three attempts in the round robin stage. Third-place game: The Pretorians essentially put the game away in the first half with three touchdowns, including a third on the day for Strobl. A pair of Sebastians, Czyż and Lanca, scored the other two for Skoczów, who coasted in the second half on their way to a 22-6 victory and third place in the group. The Giants B got their only points of the game in the fourth quarter, on a 40-yard touchdown reception by Miłosz Cynka. Championship game: Each team had at least one touchdown in all four quarters, as the Broncos and Re'B'els exploded for a PLFA 8 record 82 combined points. The lead changed hands five times in the first three quarters, with neither team leading by more than a touchdown until Silesia scored early in the fourth quarter to make it 36-26. The Broncos, who beat the Re'B'els 29-24 in their first meeting a few weeks ago, came right back on Bartłomiej Bielarz's second touchdown run of the game, but Rębowski put the game out of reach with a 73-yard touchdown run on the next possession. 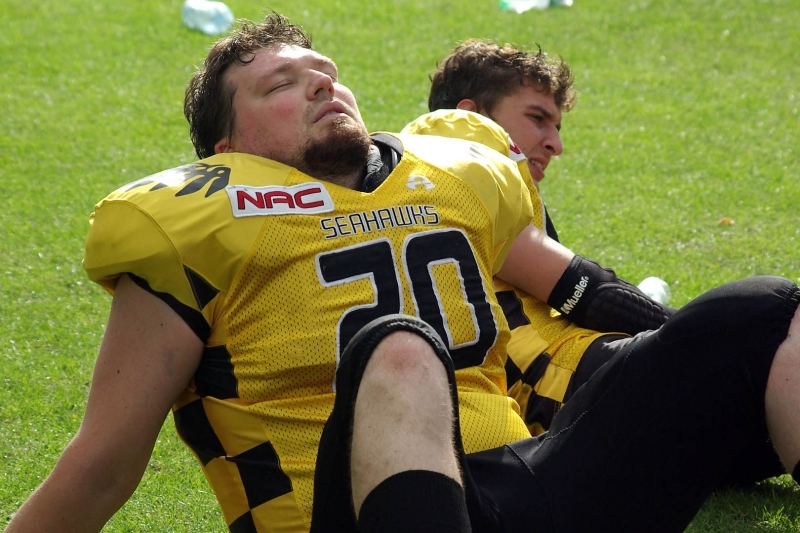 Rębowski scored three times in the game for the Re'B'els, giving him a total of five touchdowns for the day. Overview: Each team won a game in the second North Group tournament, leaving the Seahawks B atop the standings with an overall record of 3-1. Both the Griffons and the Archers finished the group with records of 1-2-1, the tie coming in the first weekend of games. Fatigue was a big factor in the second tournament, with first the Seahawks B and then the Archers losing the second of back-to-back games. 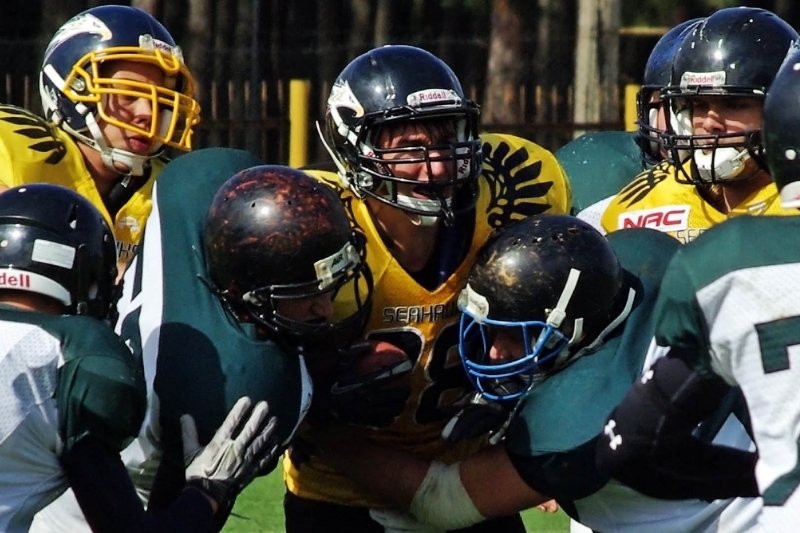 The Griffons finished second in the group after beating the Archers, although Bydgoszcz ended up with some bragging rights as well by beating the Seahawks 32-6. Game 1: The Seahawks beat the Griffons by two points for the second time this year in a close-fought affair to open the second North Group tournament. Słupsk went ahead 8-0 in the first quarter on a short Kamil Białowąs touchdown run, and they held that lead all the way until halftime. 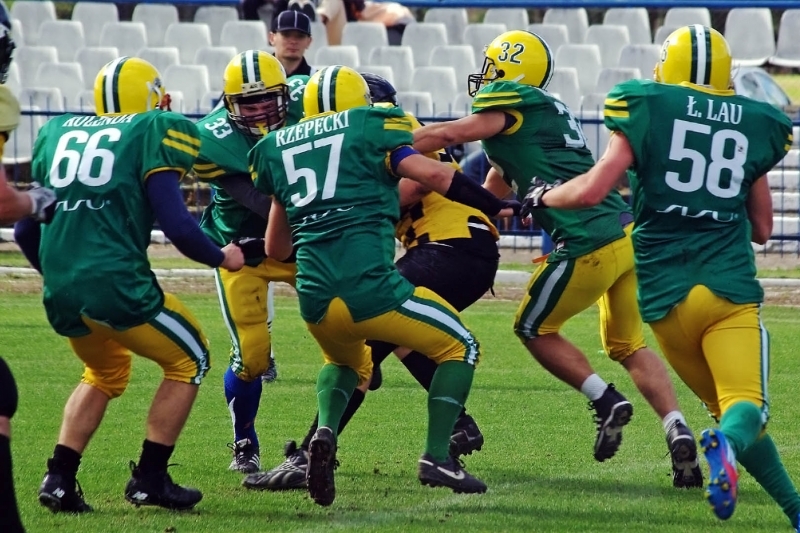 They were able to get the lead out to 16-6 midway through the third quarter before touchdown runs by Aleksander Kordyś and Mikołaj Meller swung the game into Gdynia's favor. Game 2: The comeback in the first game seemed to have left the Seahawks with nothing left in the tank, as they were dismantled by the home Archers 32-6 in the second game for their only defeat so far in 2012. 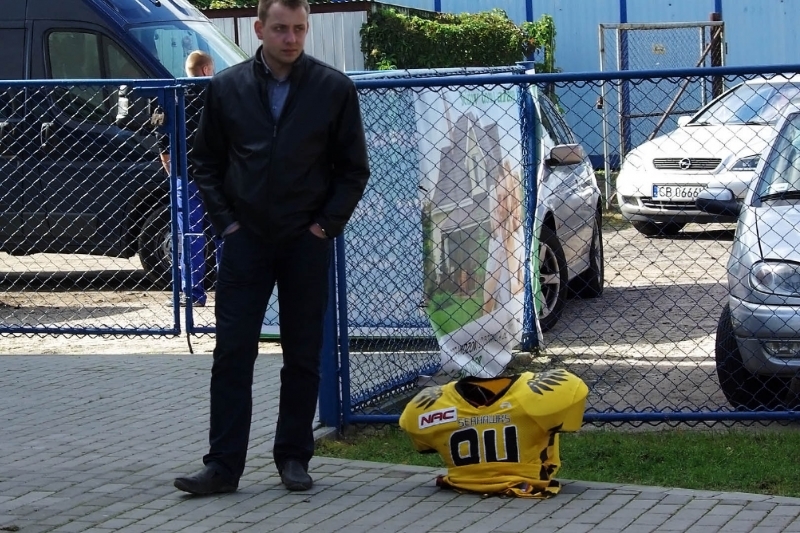 Paweł Kubiak threw three touchdown passes for Bydgoszcz, who got touchdowns from five different players in the victory. Game 3: In the final game of the tournament, the Griffons got their first victory of the year by jumping out to a 22-6 lead before the intermission and maintaining a comfortable cushion throughout the second half. 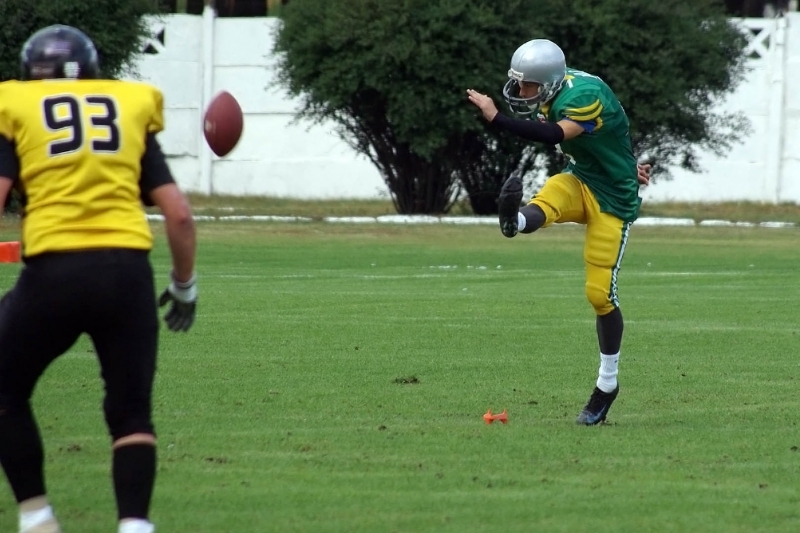 Kamil Iwanicki ran for three touchdowns for Słupsk, including a 40-yarder in the fourth quarter that virtually iced the game for the Griffons. Kubiak played well in defeat, throwing for a touchdown and running nearly the entire length of the field for a score on the ground in the third quarter. Overview: Defense ruled in the second South Group tournament, with the four games averaging a total of 19.5 points apiece. More than half of those points came in the first game, between the BEagles and the Kozły B team, while the Wilki found themselves on opposite ends of shutouts in the second and third games of the day. The Spartans B then got revenge for a 30-6 defeat in the first tournament by beating the BEagles by a point to take the group title. Game 1: The tournament started well for Kozły B, who took a 12-8 lead into the locker room on the strength of touchdown runs by Krzysztof Cymbrowski and Bartosz Pawlak. The BEagles got the last 20 points of the game, however, taking the lead on a 65-yard touchdown run by Bartłomiej Rota. Artur Górski threw for two touchdowns and ran for another for Warsaw. Game 2: The tournament's home team, the Wilki, played much better in the second weekend of games than in the first, a fact that was evident in their 8-0 loss to the eventual group winners, the Spartans B. Although Pabianice was not able to put up any points against Warsaw, their defense didn't allow any either, with the only score of the game a 50-yard fumble return for a touchdown by Marcin Szczepański in the second quarter. Third-place game: The Wilki went right back into action to face Kozły in the third game of the day, which was to decide third place in the group. 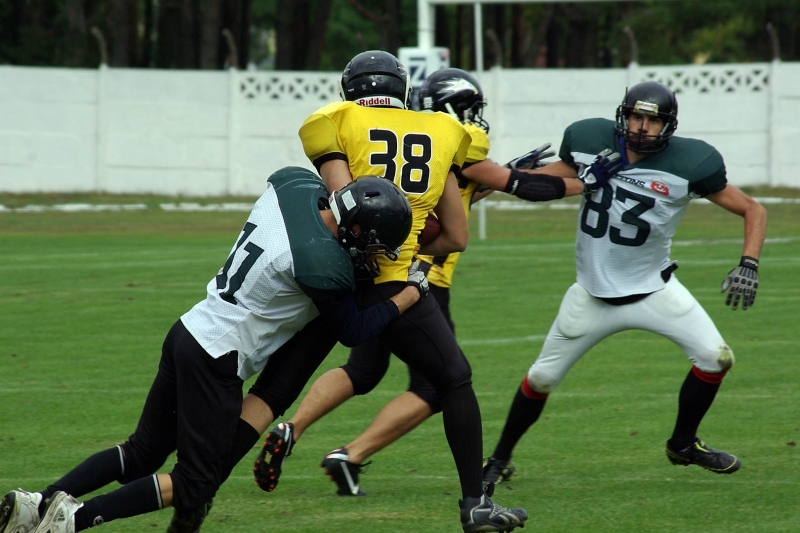 The Wilki defeated Kozły 16-8 on August 19 in Poznań, and the result was not much different in Pabianice with the Wilki shutting out Poznań 13-0. James Hale's 35-yard touchdown reception gave Pabianice the lead in the first quarter, and Mateusz Ruta added a punt return touchdown in the second half. Championship game: The North Group's title game was a revival of the Warsaw derby from a month ago. The BEagles dominated that game in winning 30-6, but Sunday's rematch was a much more competitive contest. Emil Juraś finished off a second-quarter scoring drive with a two-yard touchdown plunge to give the BEagles an 8-0 lead at halftime. Mateusz Wroński cut the gap to 8-6 with a 46-yard touchdown run in the third quarter, but the failed conversion left the Spartans trailing by two. The score stayed the same until the final minutes of play, when the Spartans put together a drive that culminated in a 27-yard Aleksander Stefański field goal that gave them a one-point lead and the championship.